Looking for some great work? Here is the best opportunity to do something for nation. Want to know how? Find it out in the information given below. Earn money while Helping nation. Our respectable Prime Minister narendra modi has launched new website recently to help Indian people to get the maximum benefit of services in major areas and other social activities. The official link to website is mygov.nic.in. Visit the website and get the clear idea about the website. The CSC scheme was executed under the national e-governance plan formulated by the department of electronics and information technology (DeitY), Government of India, the common services centres (CSCs) are ICT facilitated front end service delivery points at the village level for delivery of government and many others. The scheme is activated in a public private partnership framework with a spotlight on rural entrepreneurship and market mechanisms. If you want to participate in the contest then you have to design a logo and name for the CSC scheme. 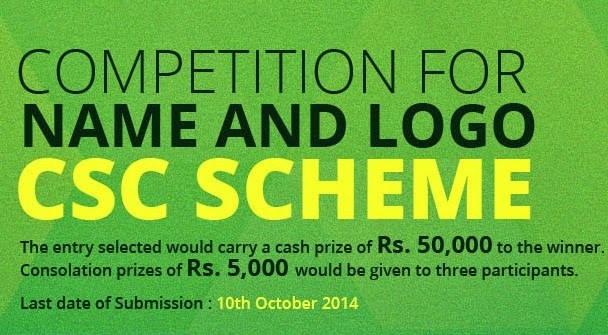 The last date for the submission of competition for name and logo CSC scheme is 10th October 2014. You have to submit your suggested new name and designed Logo for CSC scheme before 10th October 2014. Moreover, the entry selected for the unique name and Logo design will be given cash prize of Rs. 50,000 to the winner. In addition, the consolation prizes of Rs. 5000 would give to three participants. Do you want to become the winner of Rs. 50,000? Then start working from now onwards to submit the best entry! What are you thinking? Participate and do something great for our nation. On the official website link given above you can get details about the latest contests and social activities of India running by PM narendra modi. For any queries or doubts please leave comment below. Moreover, if you want to give suggestion or share your ideas on any topic related to http://mygov.nic.in. We would love to hear from you! Let’s create an incredible India together! Jay Hind!